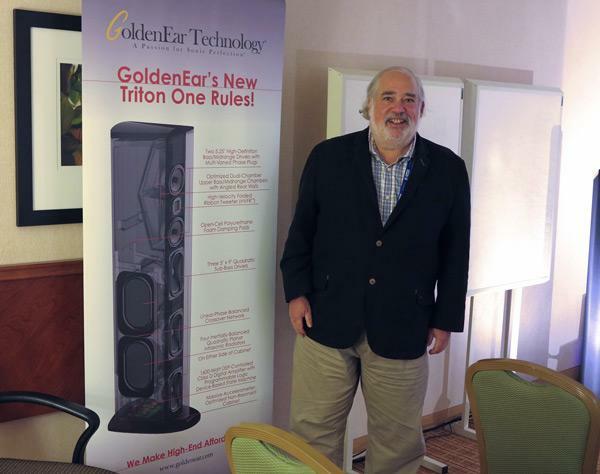 GoldenEar's Sandy Gross may be an audio legend of sorts, but it was not until the last day of RMAF 2014 that I finally met the man and discovered two things: 1) His Triton One loudspeakers ($4998/pair) are amazing-sounding, especially given their price, and 2) He is an absolutely delightful individual. 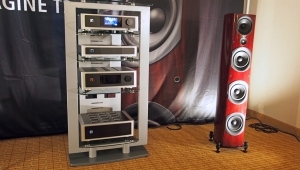 Each speaker is equipped with a 1600W, DSP-controlled class-D digital amplifier with a "programmable logic device-based state machine." I'm sure that I don't know exactly what that means, but I do know that, combined with Stillpoints Ultra 5 feet under the speakers and, on the walls, their absorber/diffuser/resonator all-in-one Aperture Panels ($650/each), the sound was exceptional on Reference Recordings' Minnesota Orchestra version of Copland's Fanfare for the Common Man. Note as well that this was not with ultra-expensive electronics, but rather with Marantz's SA11-S3 CD/SACD player and PM11-S3 100Wpc integrated amplifier, with everything strung together by AudioQuest cabling. Anders Ertzeid of Hegel was in the midst of explaining that he was sourcing music from Tidal's streaming service when I entered the room. There could have been no better testimony for both Tidal and Hegel than the sound in this room, which was one of many excellent sounding rooms sponsored by Listen Up of Colorado. 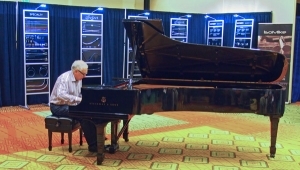 "Sounds fabulous, spacious, with natural timbres . 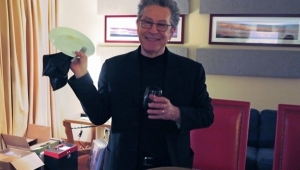 . . everything in balance," I wrote in my notes of tracks by Bruce Springsteen and Pink Floyd. This, mind you, was not of hi-res content, but rather of Red Book-quality music streamed from Tidal via iPhone using Apple's AirPlay. 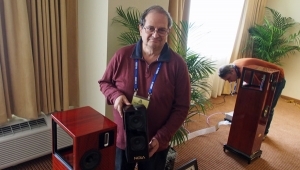 And while the speakers were not exactly cheapthey were Magico's excellent S3s ($22,600/pair)and the cabling a combination of Nordost Blue Heaven power cables and hardly bargain-basement but downright superb Heimdall 2 speaker cable, the sole piece of electronics gearHegel's forthcoming H160 integrated ($3500), a 150Wpc integrated, equipped with AirPlay, that will be available by December 7was astoundingly affordable for the sound quality. The preceding two rooms signaled a welcome upturn in sound quality that consistently satisfied no matter what system I listened to. 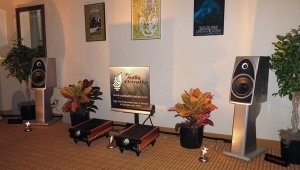 A case in point was the Monitor AudioClarus AudioCyrus Audio room, one of three rooms sponsored by Dave McPhee's Audio House of Denver. 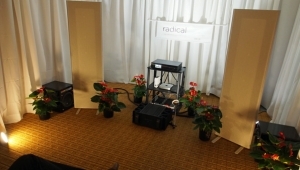 Headlining the room were Monitor Audio PL200 loudspeakers ($9000/pair) and the first showing the world of the Cyrus Stereo 200 amplifier ($3499). The latter, which launches in November, is a hybrid class-D amp, and uses linear power supplies on the input side that are claimed to move the Stereo 200's sound much closer to what you'd hear from a class-A/B amp. The baby also delivers 200W into 8 ohms, and 360W into 4. I especially liked the grounded nature of this system's sound. Neutrality ruled, save for some bass booming. The system could open up only so far on my Channel Classics SACD of Mahler Symphony 5 before the bass went awry, but when the lower instruments weren't pounding and sawing away, the clarity of the presentation was deeply satisfying. 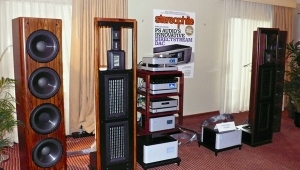 Other equipment in the chain included a combination of Clarus Audio High Current and Standard Crimson power cables, Crimson interconnects and bi-wire speaker cables, and Hark II rack ($999); Tributaries 200 Power Manager ($500); and Cyrus Audio StreamXP2 streamer (which also served as a DAC and preamp$3199), CDi CD transport ($1999), and PSX-R power supply ($1499). Simaudio Moon's pairing with Bowers & Wilkins 802D loudspeakers ($15,000/pair) and AudioQuest cabling was, hands up and down, the best showing of Moon electronics that I've ever experienced. In one of many rooms on the 8th floor sponsored by Listen Up of Colorado, a DSD recording of R. Strauss's Also Sprach Zarathustrathink the opening music to 2001not only sounded remarkably neutral, transparent, and believable, but also well under control at low frequencies. Simply put, it sounded great. 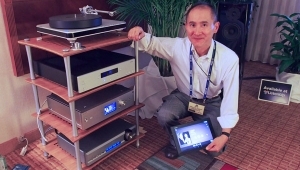 While I must give credit to the Stillpoints Ultra 5 feet ($699/each, or $5992/set of eight) that Listen Up insisted be placed under all their systems' loudspeakers, there's no question that the Moon's Neo 380 DSD DAC ($4900) with MiND streamer module ($1200) and preamp option ($600), which can handle up to DSD 256 and DXD up to 32/384, was doing something very, very right. 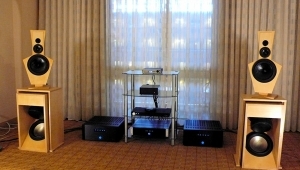 Also heard were Neo 400M fully balanced monoblocks ($8800/pair). Beam me to the Moon, Lionel and Costa. You've done it right. 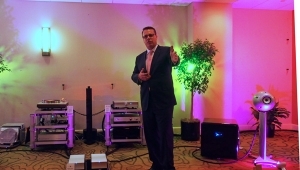 Sonus Faber's Olympica 3 loudspeakers ($13,500/pair) made fine music in Listen Up's pairing with one of the many McIntosh systems I encountered at the show. I didn't manage to write down what music was playing, but the electric guitar had a totally apt and believable cutting edge, and the system exhibited both very fast response and a large, atmospheric presentation that pulled me into the music. Doing the honors on the McIntosh end of things were the MB100 Media Bridge & server ($6000), MT5 turntable ($6500), MEN220 Room Perfect equalizer ($5000, and one reason that everything was so under control), MC452 Quad Balance amplifier ($8500), and MPC1500 power controller. Speaker cable unidentified, but the rack was by XTC Rack Designs. With the death of Ian Grant of Grant Fidelity, Opera Consonance, the 20 year-old Chinese company whose products he imported under his own company name, has entered the US market. 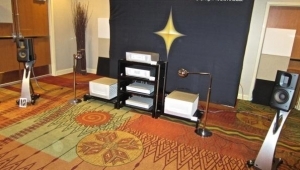 Opera Consonance is currently selling direct, but open to establishing a dealer network. 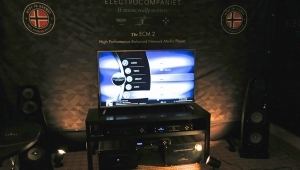 The company's Rachel Zhang showcased $16,000 worth of product that included the Consonance Reference8 digital streamer ($3800), which is controlled by iPad or Android and handles up to 32/384 DXD and DSD64; Linear1 preamp complete with European Lundahl silver wire transformers ($6000); Cyber845S 28Wpc power amp ($6000); and Opera Consonance cabling. (There must be more in there to account for the $16,000 figure, but it wasn't specified.) 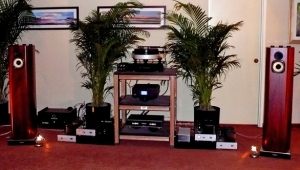 Speakers were a borrowed pair of RBH SX-8300/R towers. 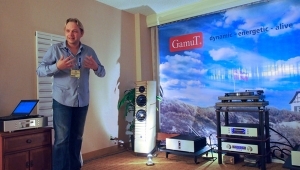 The speaker claims to descend to 25Hz 3dB, but the system could neither nail the bottom octave in a DSD version of Fritz Reiner's classic Also Sprach Zarathustrawas this the third time I heard it at RMAF?nor keep it under control. Given that the top was also rather bright, I suspect sub-optimal set-up issues. 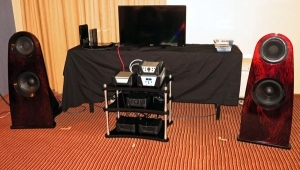 Yet another showing of McIntosh in the Marriott Towerthe show guide lists only two official rooms, but lots of other folks had McIntosh gearpaired a full complement of the company's gear, including McIntosh XR50 loudspeakers ($4000/pair) and cabling, with Wadia equipment that included their prototype a340 monoblock amplifiers ($8000/pair). The amp outputs 400W into 8 ohm, and 600W into 4. On selections that proceeded from, yes, something by Diana Krall to BB King and Tracy Chapman's "Thrill is Gone" and, in the end, the no-longer-thrilling-to-hear excerpt from Misa Criolla that showcases tenor José Carrerras, the system produced really nice sound while nailing pitches of all but the deepest bass.